THE VIEW FROM MY SHOP MMS JULY 2018 46 mmsonline.com A Metalworking Leader's Perspective The Education Gap Academic institutions have a responsibility to provide a comprehensive education to students, making them employable. UDO JAHN | GENERAL MANAGER | MODERN ENGINEERING You've seen it haven't you? Maybe you ignored it or thought it was just this one candidate, but then the next one was the same. And the next one. And the next one. If you work in manu- facturing or machining, you know that I am talking about the massive skills gap that exists in our industry, the skills gap that is stunting the growth and success of our companies. While there is not enough skilled labor out there to meet the current demand, the issue we are facing is bigger than that; the skills gap is only part of the problem. What's the other part? It's something that is going to continue to make things worse for the industry: the "educa- tion gap." The education gap can be defined as the gap between what an employee needs to know to make a company competitive and what is actually being taught in schools, tech programs and academic institutions. 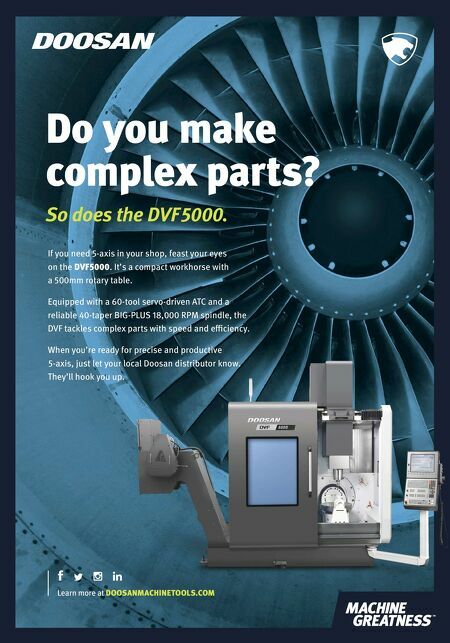 Let me explain within the framework of machining: Most institutions have not updated their curriculums to reflect the changing nature of the industry, meaning graduates are not being properly equipped with the skills they need to compete for jobs today and in the future. 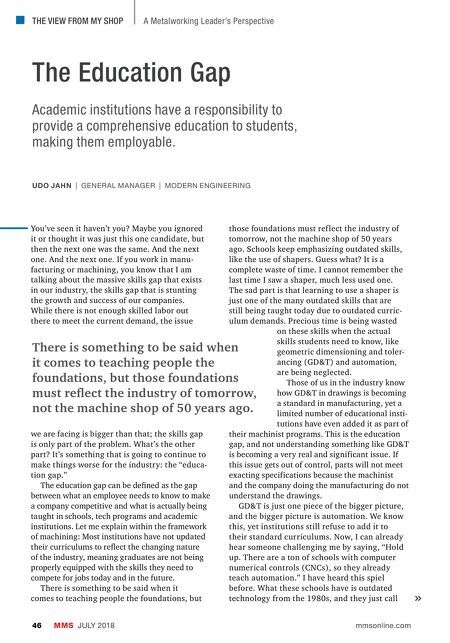 There is something to be said when it comes to teaching people the foundations, but those foundations must ref lect the industry of tomorrow, not the machine shop of 50 years ago. Schools keep emphasizing outdated skills, like the use of shapers. Guess what? It is a complete waste of time. I cannot remember the last time I saw a shaper, much less used one. The sad part is that learning to use a shaper is just one of the many outdated skills that are still being taught today due to outdated curric- ulum demands. Precious time is being wasted on these skills when the actual skills students need to know, like geometric dimensioning and toler- ancing (GD&T) and automation, are being neglected. Those of us in the industry know how GD&T in drawings is becoming a standard in manufacturing, yet a limited number of educational insti- tutions have even added it as part of their machinist programs. This is the education gap, and not understanding something like GD&T is becoming a very real and significant issue. If this issue gets out of control, parts will not meet exacting specifications because the machinist and the company doing the manufacturing do not understand the drawings. GD&T is just one piece of the bigger picture, and the bigger picture is automation. We know this, yet institutions still refuse to add it to their standard curriculums. Now, I can already hear someone challenging me by saying, "Hold up. There are a ton of schools with computer numerical controls (CNCs), so they already teach automation." I have heard this spiel before. What these schools have is outdated technology from the 1980s, and they just call There is something to be said when it comes to teaching people the foundations, but those foundations must reflect the industry of tomorrow, not the machine shop of 50 years ago.